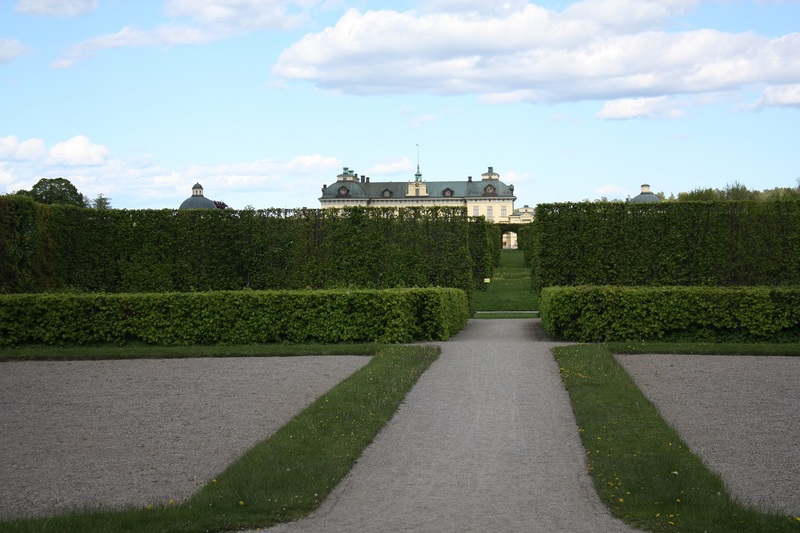 Off the back of Drottningholm Castle is this great open park. By open, I mean that locals seem to be picnicking and taking their dogs for walks here. A portion of the park (the center with the neatly raked gravel for example) is for looking only. The gates into the park. Who doesn’t want gold fringed gates? It’s hard to resist combed gravel, isn’t it? It’s kind of like looking at smooth, untouched snow. Pretty sure that statue on the fountain was of a man bludgeoning some sort of water creature. 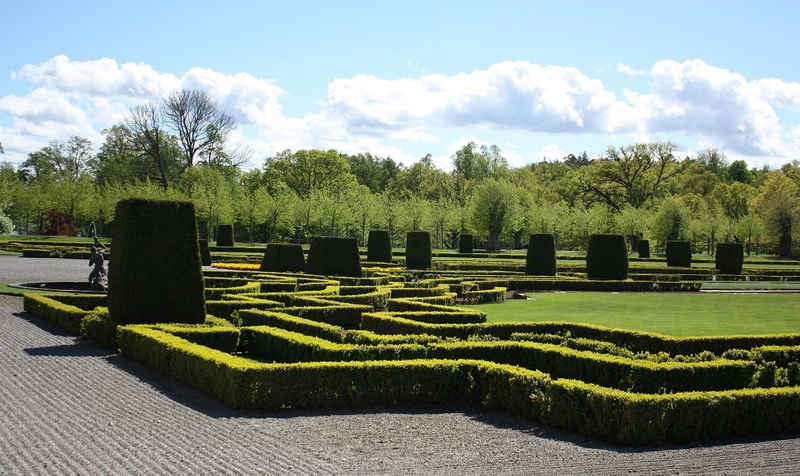 Mazes in the hedges! There were short ones as well as tall ones. As you can see, the garden went on for a ways and eventually led into an orchard and then to a path to the Chinese Pavilion. As you can see, we had great luck with the weather during our garden trip. At times it was so sunny that we could barely take pictures without squinting angrily at the camera. All pictures of me were taken by Linn! 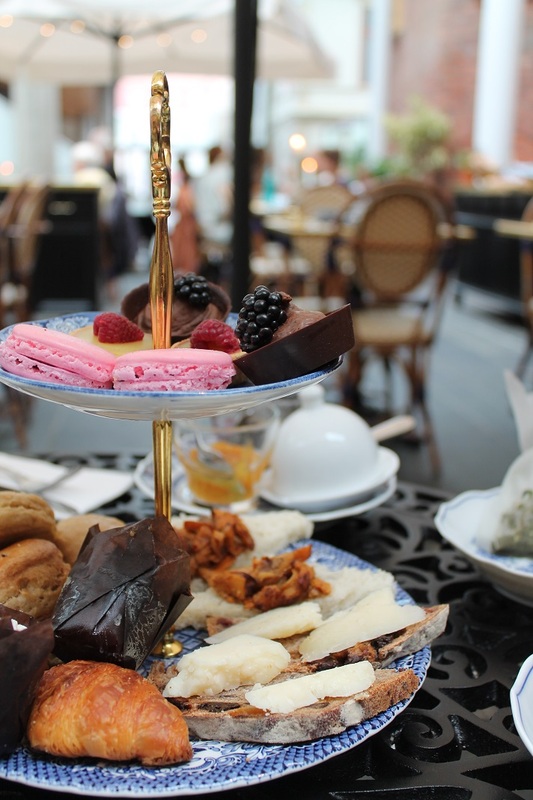 Upcoming post- Sunday tea in Umeå! 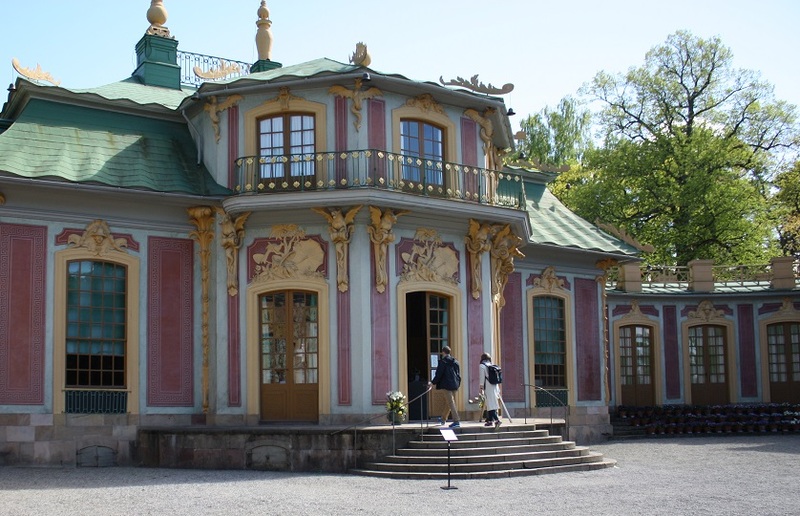 While Linn and I were visiting Drottningholm Castle we took a walk through the garden and to the Chinese Pavilion. 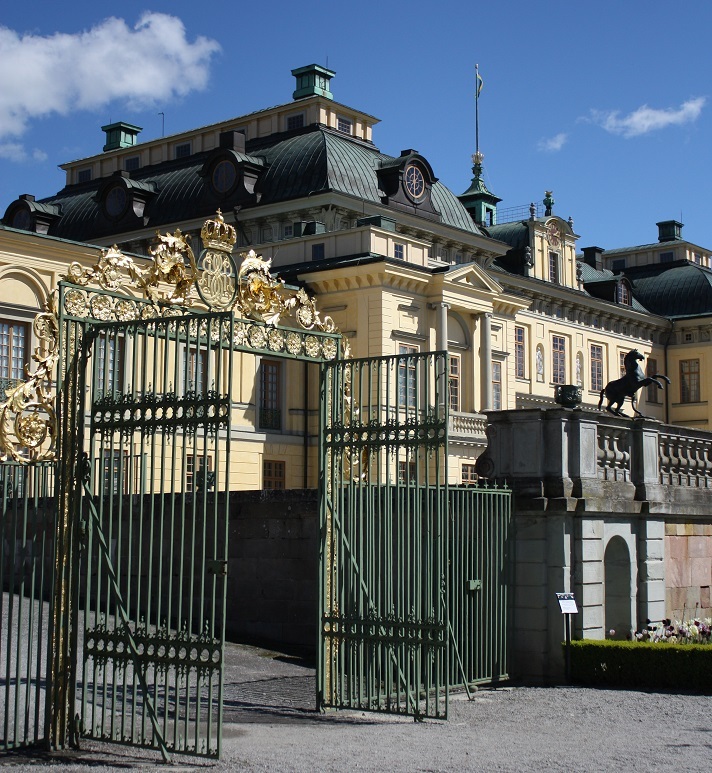 It’s basically a mini castle built in 1753 as a birthday present from the King to his Queen, Lovisa Ulrika. Obviously, he was good at giving presents. 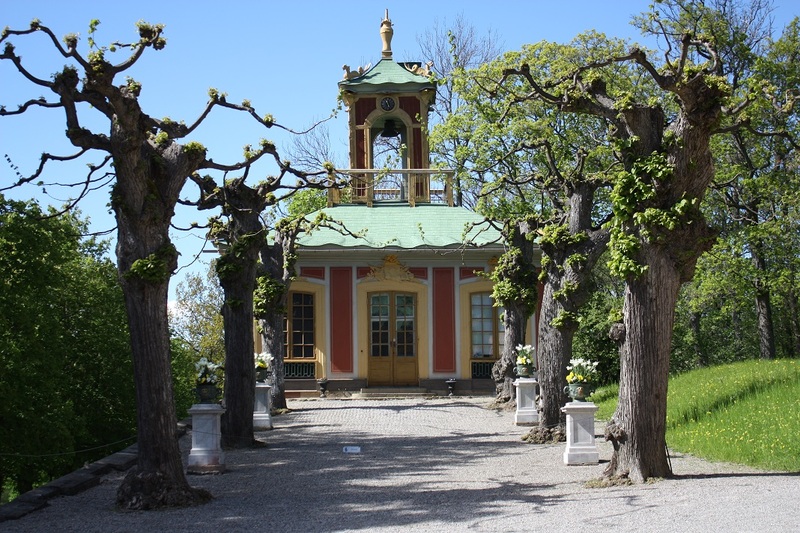 The little chapel was a separate building. There was also a separate dining room. 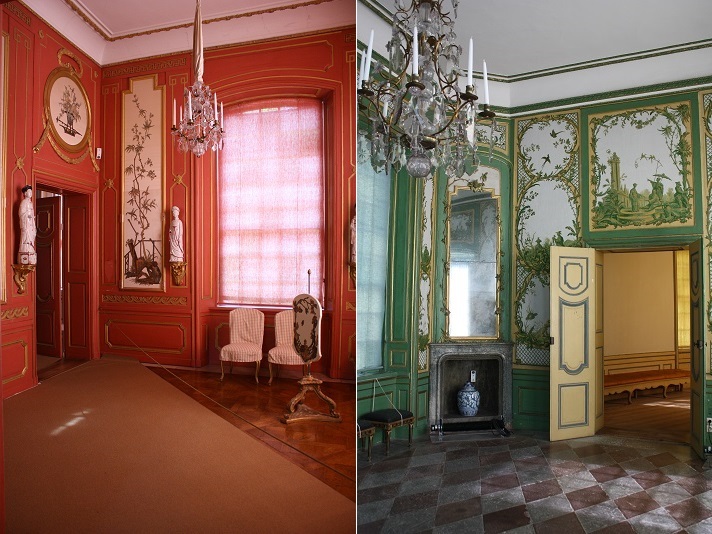 We noticed quickly that the rooms of the Pavilion were color themed. 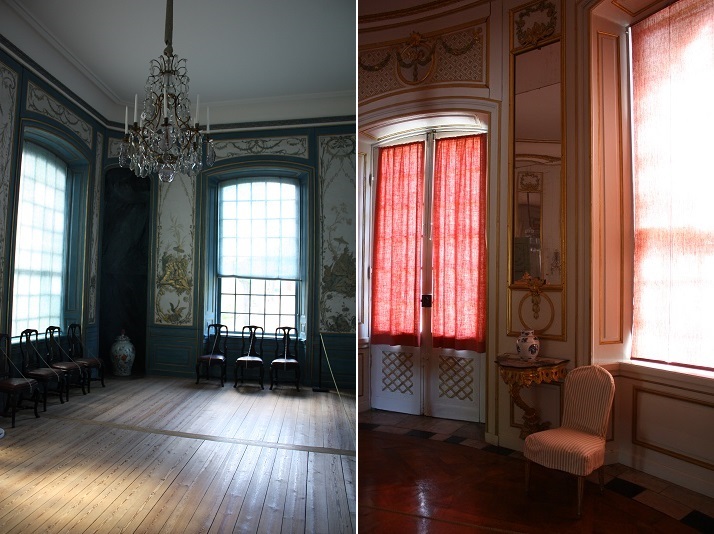 It even had a little upstairs room but it was very dark up there because they try to limit the lighting in order to preserve the rooms. So we only had filtered sunlight. Chandeliers! And I was very fond of the ‘green room’ as we took to calling it. Linn and I were incredibly lucky with this visit. When we were their the Pavilion was almost entirely empty, enough so that we were usually alone in the rooms. This trip was so much fun! I always leave castles feeling incredibly inspired. I doubt that’s a surprise or at all uncommon. 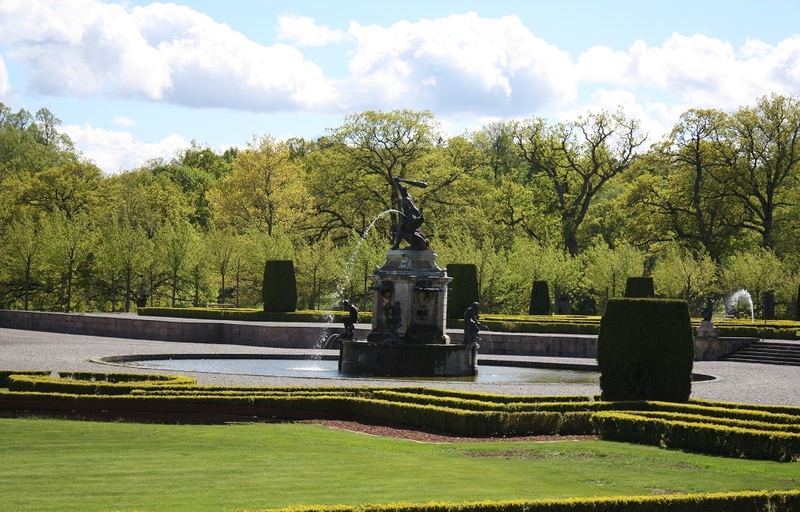 Next blog post will be about the Royal Garden! 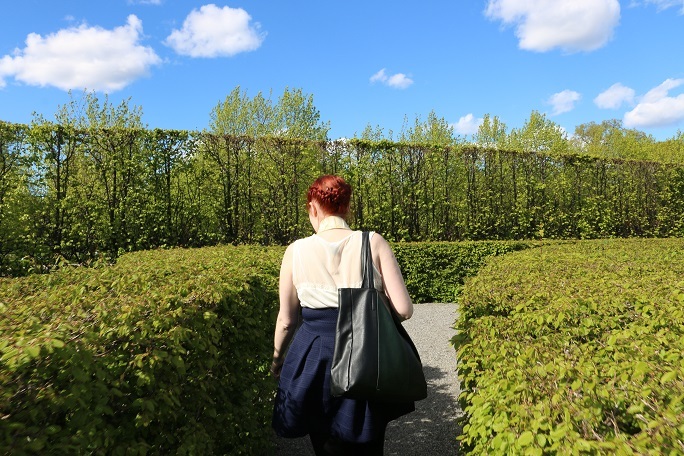 And, again, all pictures of me were taken by Linn. 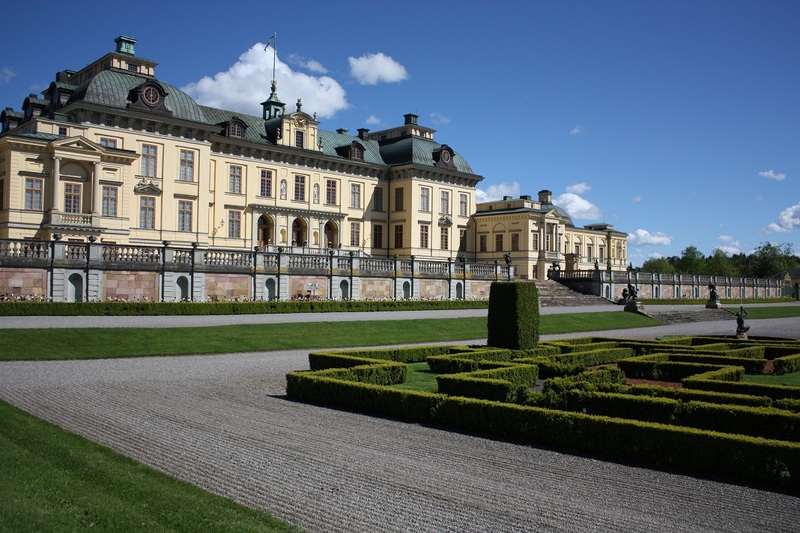 Drottningholm castle! I had the pleasure of visiting this summer and it was lovely. 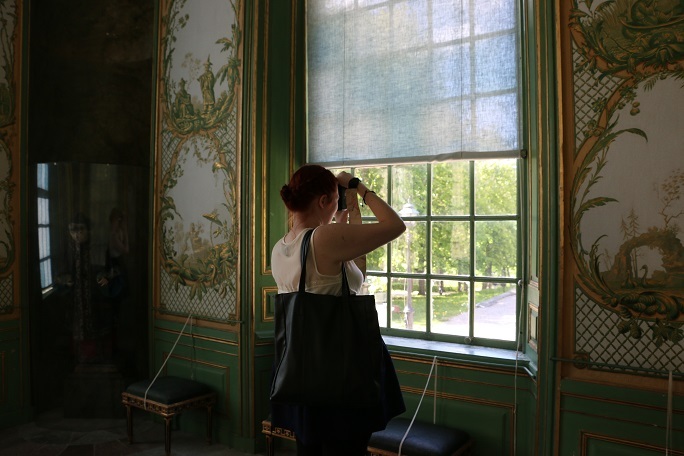 Last summer I went to the Royal Castle in Stockholm, where the King works, this time we went to Drottningholm, where the Royal family lives. 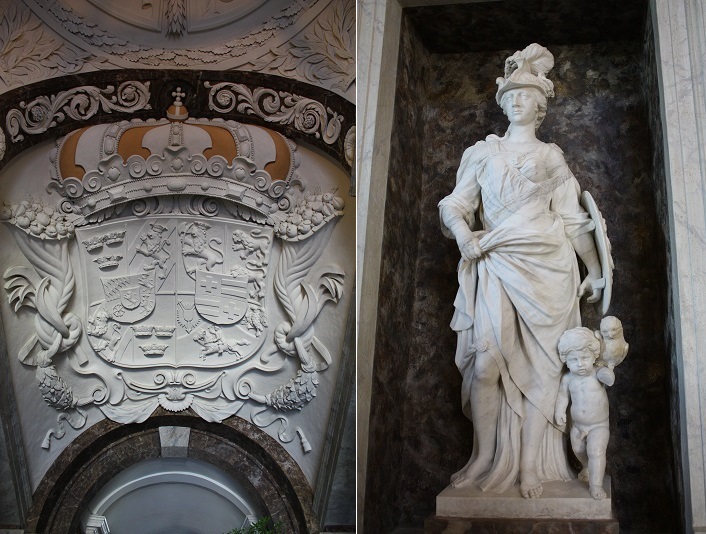 Of course, they only get to live in a portion of the castle because the rest is an amazing museum (super inexpensive to visit with English and Swedish tours) and they let you take pictures! But no flash. Don’t do it. They’ll get you. Grand is not quite a big enough word for the feeling of being inside these places. It’s so beautifully overboard. 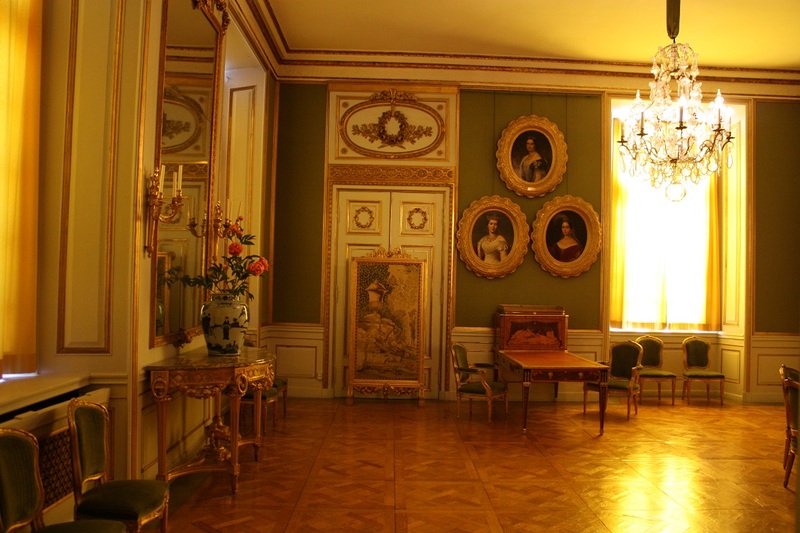 I always leave Stockholm wanting to paint my apartment gold. 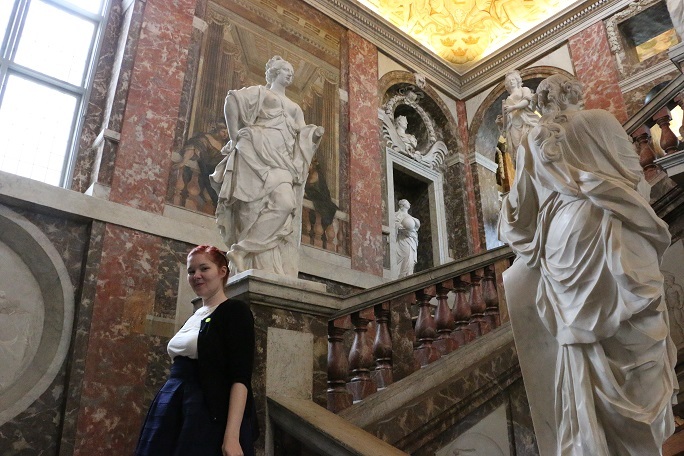 We went on the Swedish tour (because it has less people in it than the English tour) and learned all sorts of interesting things. 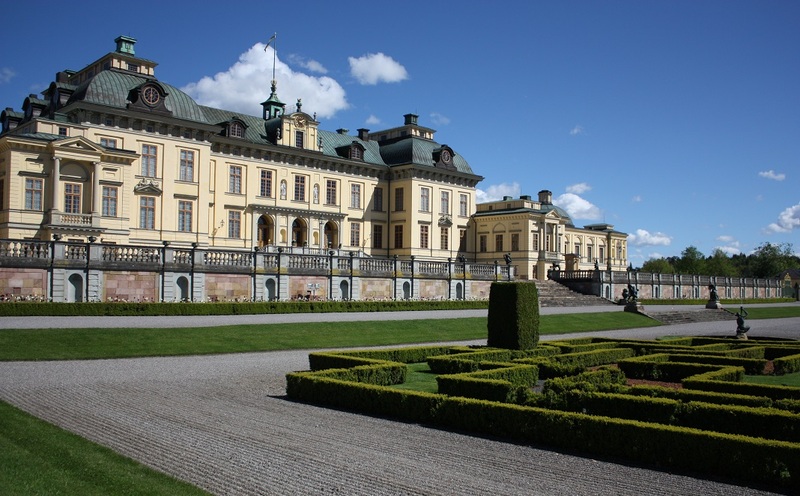 Drottningholm is a little outside of Stockholm. We took the subway to a bus. It was about 45 minutes all together but it went really smoothly. In both of my experiences with Stockholm I’ve been crazy impressed with their public transportation. There’s a bus or train just about every five minutes. Subway stations are marked with a T, by the way. Think T for Train. It’s actually T for tunnelbanna (subway) but think T for Train. We bought 24hour cards so we could hop on any train or bus. Of course it promptly started raining as soon as we got to the castle, so we ducked inside. By the time we could pry ourselves away from it to see the garden and the Chinese Pavilion, it was bright and shiny out again. 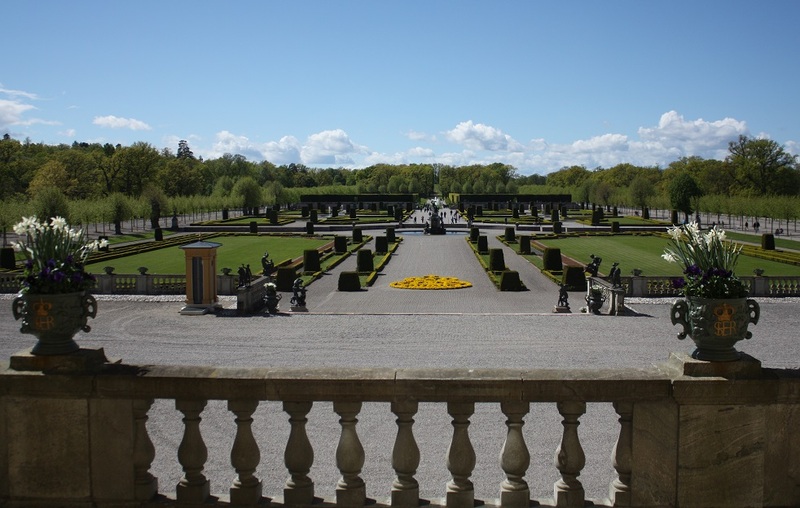 I’m going to post pictures for Drottningholm (this post), the royal gardens and the Chinese Pavilion separately, but they’re all in the same location. There’s also a theater but we didn’t get a chance to see it. 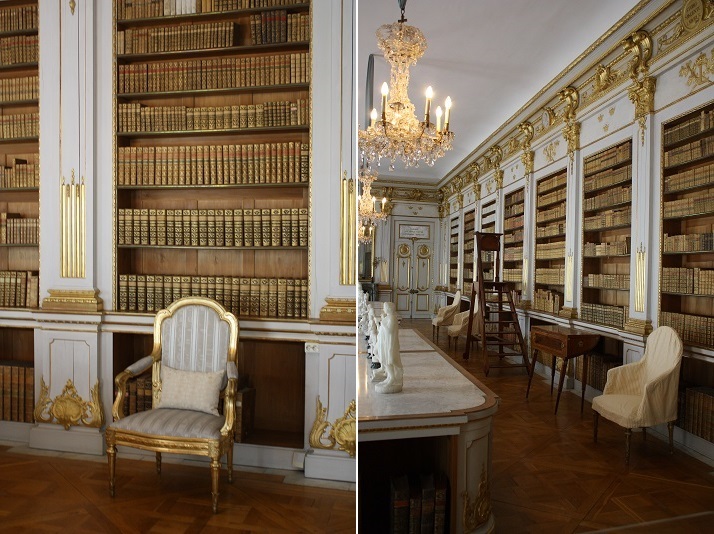 The royal library! This was, hands down, our favorite room. It was built by a very feisty queen and I have to admit, she won a lot of points with me for it. I’d almost be willing to ignore her attempted coup. 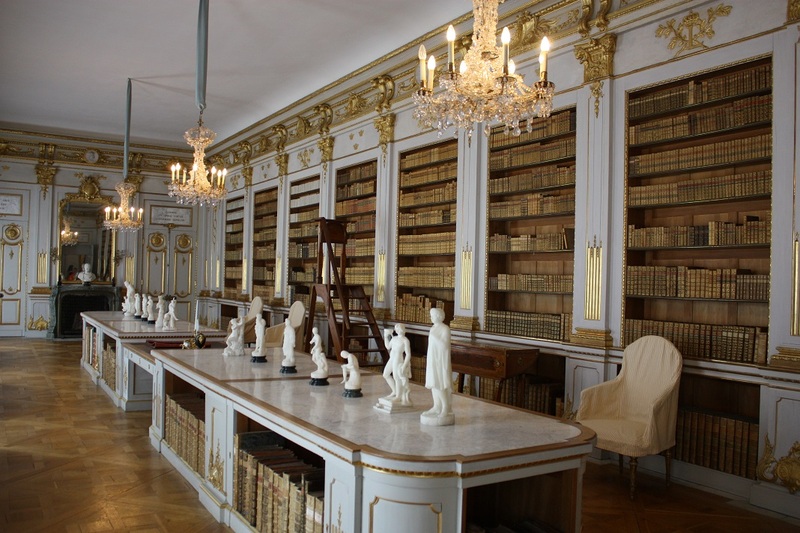 We were told that most of the books are in French. 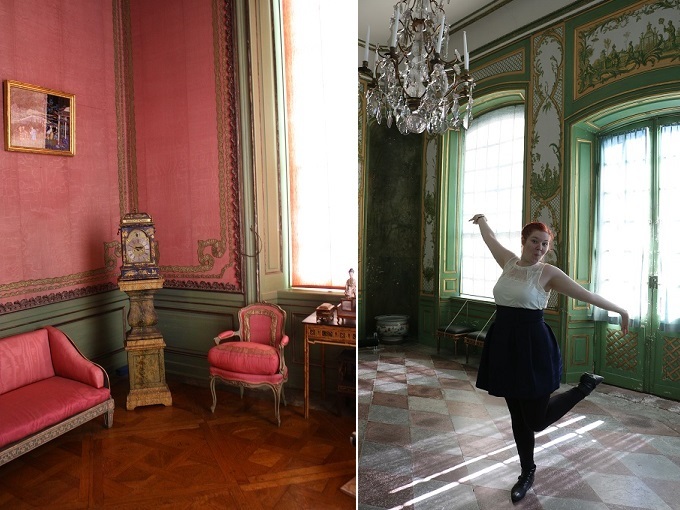 This was one of the few rooms we couldn’t actually walk around inside. 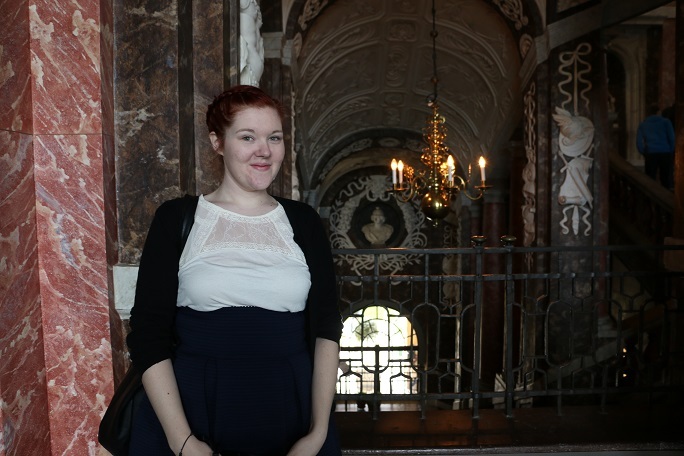 There was a glass partition about waist high to keep us out while still allowing us to take pictures and oogle. I think it might have been a spit-guard to keep our drool off the books. And a chandelier. One day that’s going to happen. 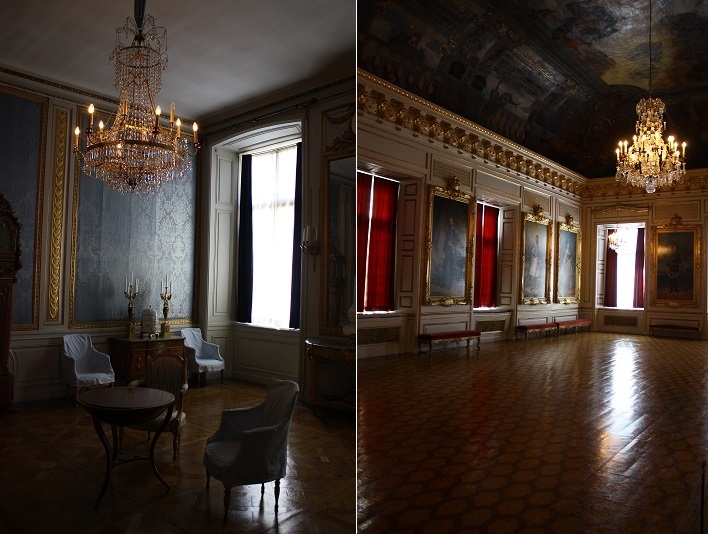 Just about every room we saw had a chandelier in it and I took pictures of all of them. 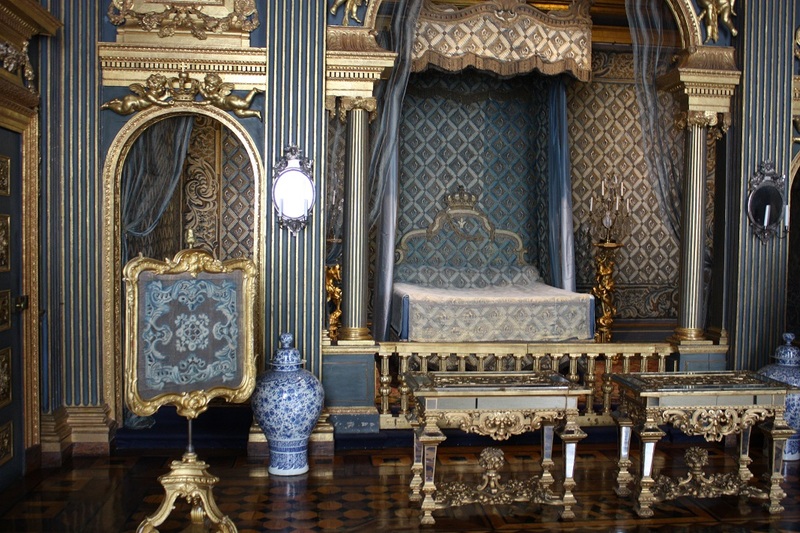 There will be another post with just those, in case anyone else likes gushing over gaudy lighting as I do. This castle was incredible. I would go again in a heartbeat and would certainly suggest it to anyone in Sweden. I know I’ve put up a number of pictures in this post, but it isn’t even close to as many as I took or how much we actually got to see. 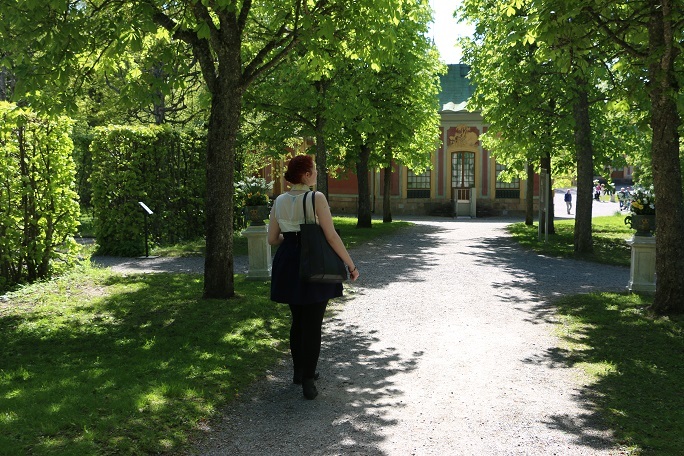 As usual, all pictures of me were taken by Linn. She is an amazing photographer and should not be held accountable for any faces I make in pictures. I can barely be held responsible for those. Soon to come will be a post about the royal gardens!